Corn and Wheat futures had a good rally off midweek lows. After two days of rally the Taylor Trading Technique was looking for a Sell Short day today. The anticipation aspect of the TTT was helpful this morning. 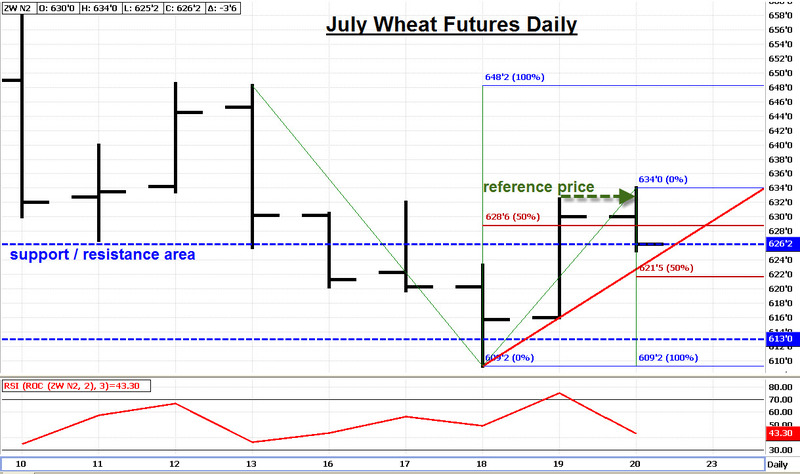 The daily chart for July wheat futures is below. Wednesday saw a test and recovery over the last major low at 613-0 followed by good upside follow through yesterday. The two day advance meant we anticipated a Sell Short day today (Buy > Sell > Sell Short day). The reference price for a TTT Sell Short day is the previous day’s high; we use the reference price to gauge the market’s trend. 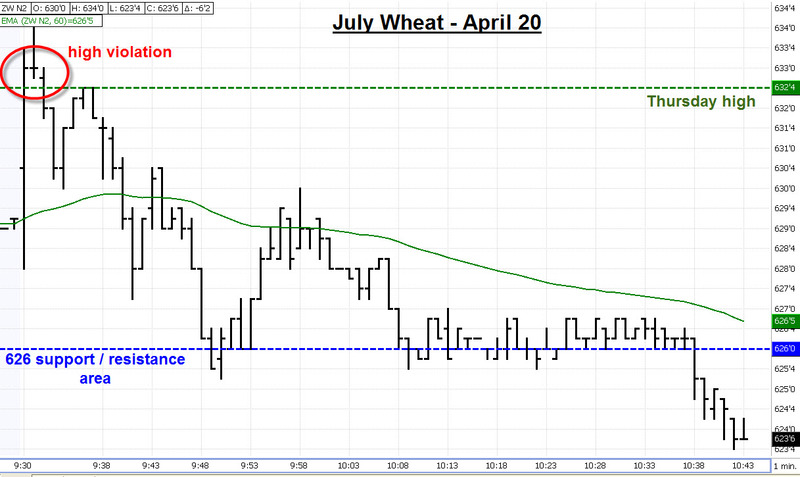 For July wheat we were watching yesterday’s high at 632-4. Last night’s session saw an early rally to 632-2 but it was unable to clear yesterday’s high; this failure led to an overnight selloff. The pre-market “chatter” was looking to buy more US corn. By the 9:30 open there was enough bullish interest to open a couple of cents higher than the overnight close; this was immediately followed by a rally over the 632-4 reference price to a session high at 634-0. The rally over the reference price was the signal to look for a short sale on a downside reversal. The market obliged, breaking back under the reference price a few minutes after the open, thus triggering a short sale. On the downside our price to watch was the 626-0 area; this had been both resistance and support over the past months. It served as support on the first post open break and was finally taken out around 10:40 AM. I’d watch 626-0 as short/ not short point at the close today. This originally appeared as a blog post in Scott Hoffman’s Futures Insight Blog.